Last night was supposed to be a poker evening at Aaron and Elissa's place, but too many people canceled. Instead, we ended up playing Dominion until about 12:30am. That was awesome, except we still had to get up reasonably early this morning, so I'm beat. That doesn't bode well for me tonight: I have a ton of studying to do for my Tuesday test. We went to church this morning then stopped by AutoZone to get a new headlight for my Outback. Since we were right by Panera, we thought we'd stop by to get a late morning snack with the boys. 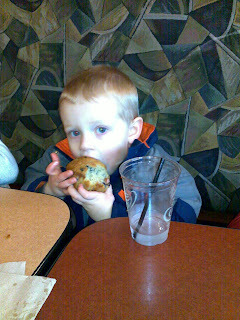 Reed and Jacob each got a blueberry muffin (though Jacob wanted pretty much everything he saw). They were both really well-behaved and had great manners, though when it was time to leave, Jacob wasn't too keen on it. Andrea had a baby shower to go to this afternoon, so I took the boys over to my parents' place for a while. I was able to study for about ten minutes total; Jake kept insisting that I make him more paper airplanes or fix the ones he had that unfolded. Andrea came out after the baby shower, we had dinner together and stayed for a little while afterward, then went home. She's got her first day of work tomorrow and personal training, so I've got the boys and have to figure out when I can study.